First off, nobody would believe me, and second of all, how does one go about coming to terms with a terror so unbelievably real that it literally make the hair on your arm bristle, and your flesh crawl? The “Men in Black” – or “MIB” for short – have had this ominously evil effect on dozens of other level-headed individuals. But let me explain in more detail for those not aware of the regin of terror that has gone on in the UFO field, almost totally undetected for so many years. There are it would seem, at leased two different distinct types of MIB that we must contend with. “Secret agents” posing as either Air Force or other authorized officials have, from time to time, popped up in the annuals of ufology, prompting, in the late 1960s, the Defense Deparment’s Vice Chief of Staff, to issuse a warning to all Branches of the service to be on the look out for individuals impersonating Air Force officers. In other instances, the MIB do not impersonate government officials, but arrive seemingly out of thin air dressed in sinister black garb, only to frighten the literal daylights out of those who have experienced a UFO sighting, undergone a close encounter with aliens, or somehow stumbled upon “hard evidence” that offers additional proof that a particular case is legitimate. Often the MIB are said to be able to read the minds or control the thoughts of those they set about to harass. They can also tap telephones lines, invade a person’s dreams, interrupt the flow of mail, cause hallucinations, and, in general, reek utter havoc on the lives of those they seek to intimidate. They have tried to run over witnesses, or have driven them off the road, shot at those they are trying to “silence,” and even physically attacked certain individuals (if we are to believe the more outlandish MIB stories that have spread throughout the field). Frequently, the Men in Black arrive upon the scene in a sinister looking vehicle – most often time a black Cadillac with elongated fins – which very often is an older model that for all intents and purposes looks remarkably shiny and new. Few ufologists now doubt their existence. There are those researchers who say the MIB are agents sent by an earthly power…such as the CIA, or even the notorious Russian KGB. Others, upon close examination, rule out such possibilities, insisting that because of their awkward appearance and peculiar behavior, the MIB are somehow affiliated with the ETs themselves, perhaps a sort of interplanetary Mafia that has been set up, and whose primary purpose is to cover their trail in instances where a report is likely to get too much attention, and the witnesses have to be SILENCED at ALL cost! The terrorists of ufology have always been with us, their existence having been well documented in reports the go back a hundred years or more. In 1864, for example, a UFO dropped several strange artifacts over a small Texas community. The objects – of unknown origin – were picked up and placed in a store window on the main street of town. The very next day a “stranger” dressed in a long black coat visited the shop keeper and offered a “high price” for the objects. But, because they did not belong to him, the store owner said he did not have the right to sell the items. That night the store mysteriously caught fire and when the ashes and rubble were sifted through, none of the artifacts could be found. Nor was the “stranger” ever seen again! 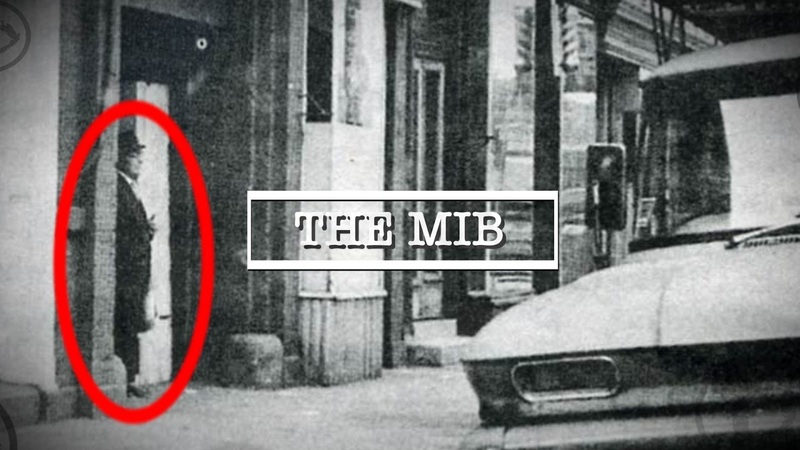 In more modern times researchers like John Keel, Timothy Green Beckley and the late Gray Barker have done a credible job of documenting the activities of the MIB. In his now classic work THEY KNEW TOO MUCH ABOUT FLYING SAUCERS, Barker told the story of Allen K. Bender, director of the now defunct International Flying Saucer Bureau, an organization that flourished in the early 1950s. According to published accounts (see MIB – ALIENS AMONG US by Beckley), Bender made a telephone call to a friend in which he casually mentioned his theory and subsequent visitation of the three men. Immediately after hanging up, the phone rang. A voice uttered that he knew of Bender’s conversation and that he had made a “bad slip” and warned him to stop his activities RIGHT AWAY! The same day Bender suspended his organization’s newsletter and refused to talk about UFOs to his closest associates, his friends or even members of his immediate family. He was convinced that if he gave away the “secret” something very terrible would happen to him and those around him. Other researchers have not been so lucky. One Australian ufologist was pushed down a flight of stairs in a large deparment store by seemingly invisible hands, since there was no one near him at the time of his fall. There have been other cases where UFO witnesses have been kidnapped right off the street, taken to some windowless MIB headquarters while blindfolded, sometimes drugged, and threatened with physical harm if they continued to talk about their experience. For just such a reason, Carrol Wayne Watts of Loco, Texas doesn’t much like to talk about his UFO experiences anymore after he went to the aid of a motorist and was hit by a heavy object in the head while his back was turned. Watts claimed that that a space craft had landed on his property several times, that he had gone onboard the craft, met the object’s occupants, and taken photographs to validate his story. At first, he freely talked to the press, but later refused to do so, after his house was supposedly sprayed by machine-gun fire.